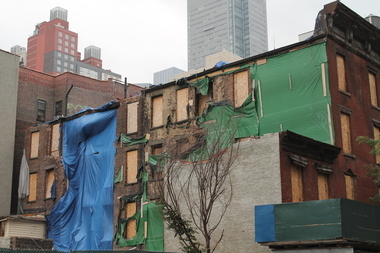 The owner of the abandoned Ninth Ave. tenements purposefully destroyed the back facade making way for the city to declare them unsafe, according advocates and DOB records. HELLS KITCHEN — The landlord who let five tenements deteriorate into total disrepair over nearly 20 years, removed some of the building's back walls without a permit, clearing the way for the the city to order their demolition, according to housing advocates and Department of Building records. The five apartment buildings are on Ninth Avenue, between 37th and 38th Streets, a small area that was protected from any kind of demolition by the Hudson Yards rezoning. That protected strip runs on either side of Ninth Ave. between 35th and 41st Streets, according to the text and maps of the 2009 rezoning, and was meant to preserve affordable housing and the character of the neighborhood, according to community members who helped draft it. But one of the main caveats to that protection is that a building can be demolished if the city determines it is structurally unsound. In order to exploit this loophole, advocates charge, landlord David Israeli hired a crew to hack away at the back facade of the tenements earlier this year without a permit. Department of Buildings records confirm that the city slapped the landlord with four stop work orders on April 14. Work was happening without a permit, and rear walls of 485 and 489 Ninth Ave. had been removed, according to records. "The stop work order was issued for removal of the rear wall without a permit," Department of Buildings spokesman Alexander Schnell confirmed. Tarps now drape the backs of the crumbling tenements. “It was like a doll’s house, all the floors open, all the structure exposed and no roof and no permits," said Director of Clinton Housing Company Joe Restuccia who reported the demolition to the community board. Israeli previously told DNAinfo that “the back wall of these buildings collapsed after winter,” but he could not be reached for further comment. Once the back facade had been destroyed, the city conducted an inspection and on Aug. 8 ordered emergency demolition for five of the buildings on that block - 485, 487, 489, 491 and 497 Ninth Ave, DNAinfo previously reported. If the buildings were torn down, the owner has the right to build new ones that are up to 120 feet tall, nearly three times the height of the current tenements and there are no restrictions on how much affordable housing he has to build, according to the city planning department. "If this becomes a paradigm, what about the next building?" Restuccia wondered. "Here's a way to get around a very important piece of zoning."